If you've never had a Cobb salad before, do yourself a favor and run down to the nearest restaurant or deli and order one. Savor the crispy lettuce, chicken pieces, bits of bacon, avocado, the cheese and the hard-boiled eggs. Enjoy the tangy dressing and the beautiful presentation. Chances are, you will be a fan for life. In my experience, even people who don't normally like salad make an exception for Cobb salad. It is the salad that my picky eater sister came back from vacation just gushing about, and it is the salad that my salad-hating brother actually requested me to bring over once. It's plain delicious. This chicken salad channels all the flavors of a Cobb salad in a delicious, creamy chicken salad that you can enjoy on bread, toast, bagels, pitas, crackers or even lettuce. Mayo-haters can rejoice because it actually uses whipped avocados and olive oil as a base instead of mayonnaise. 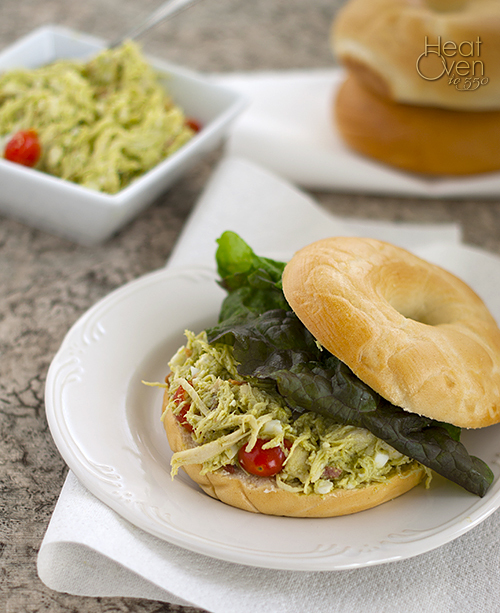 It's amazing how creamy and smooth avocado can become after whipping for a minute in a blender or a food processor and how well it works to hold the chicken salad together, all the while adding a delicious avocado flavor. Add in some flavors from Cobb salad dressing, such as some Dijon mustard and lemon juice, and throw in some of the traditional Cobb salad ingredients, such as bacon, eggs and tomatoes, and you've got one amazing chicken salad. I try to make this every time avocados go on sale in my area and I think about it between those times. Try this out and pretty soon you'll find yourself searching grocery flyers for avocado sales, too. In a blender or a food processor, mix together avocados, olive oil, red wine vinegar, lemon juice, Dijon mustard and salt until smooth. Scrape avocado mixture to a medium bowl and mix in chicken, bacon, cheese, tomatoes and eggs. Serve. Cobb salad has always been one of my favorites, so I love this twist! I like that it has such a light, refreshing dressing, too! Sounds delicious. 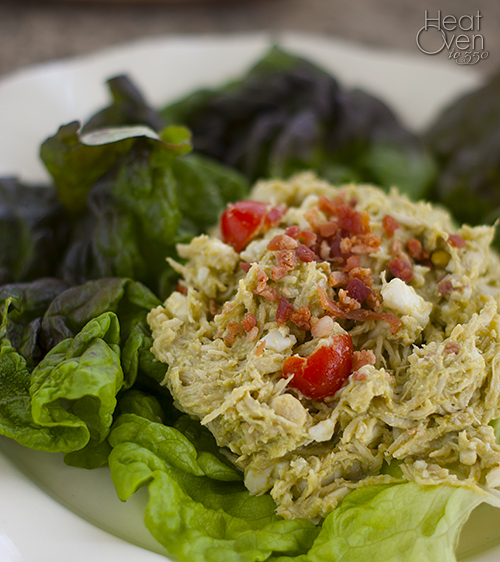 Nice twist on chicken salad! Awesome idea! Cobb salad all mixed up with chicken. I love it! This could be the perfect combination for a sandwich. Looks delicious.